Maximize your email newsletter readership and social media presence with integrated social sharing tools for your newsletter. 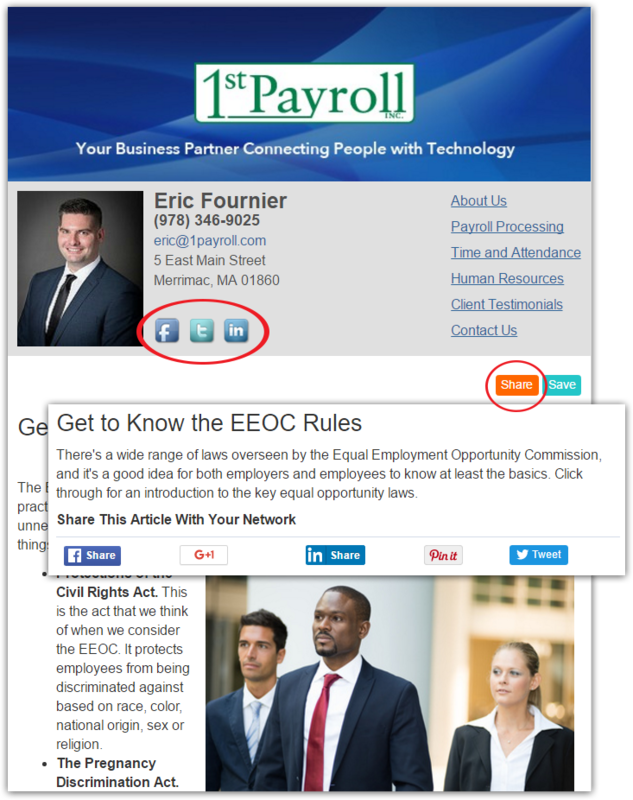 Every newsletter or email message you send to your contacts can include links to your social media sites. This means that every time a contact receives an email from you, they’ll be reminded to find your business on their favorite social network. Whether you’re new to social media or you’ve integrated it into your online marketing strategies ages ago, our email newsletters also regularly provides you with quality content to share. Repurpose any of your newsletter articles by posting them, with just a couple clicks, to your social media sites. We make it easy for you to maximize your newsletter readership and social media presence, all while keeping your clients, prospects and referral sources informed with relevant, educational content. Plus, the same simple social sharing functions are built-in for your readers to use as well. Clients and prospects who receive your email newsletters can easily share your articles on their favorite social networks to increase word-of-mouth marketing for your business on social media.